In accordance with various applicable rules and guidelines concerning the use of photographs, endorsements and testimonials in advertising, please be aware of the following: Before and After Photo Disclaimer: With all before and after images shown on the site, no claims are made that results are guaranteed to be exactly the same. Results will vary by individual patient and no guarantees are made. Images of actual patients are shown for informational purposes only. With cryotherapy alone, we were able to successfully remove this ear keloid. 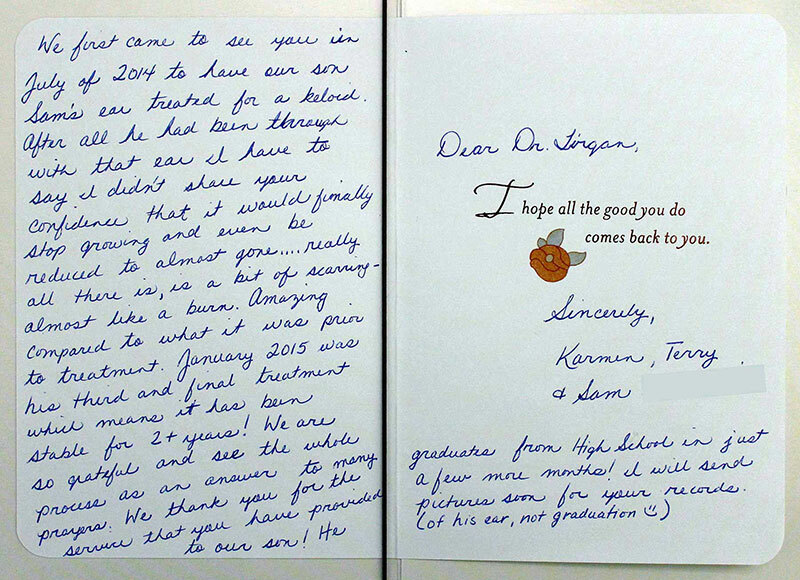 Dr. Tirgan is thankful to the parents for submitting this follow up the image as well as their warm card. New York has hundreds of dermatologists and plastic surgeons who among everything else, they also treat keloids. But, Dr. Tirgan is the only physician whose medical practice is solely focused on the treatment of keloid patients. For the past several years, Dr. Tirgan has provided care to close to a thousand keloid patients. There are so many unanswered questions in Keloid Disorder. Dr. Tirgan believes that patients need to find physicians that they can trust to come up with best answers for them. There are numerous patients whose keloids have gotten worse with surgery and other ineffective treatments. As a leader in clinical keloid research and cryotherapy for keloids, Dr. Tirgan is challenging standard approaches to many types of keloids. He has introduced treatments that not only achieve excellent results, but most importantly, do not cause harm, and do not put patients at risk of worsening of their keloids. If you suffer from keloid - if your keloids have gotten worse despite treatments or after surgery - or if your doctor cannot think of an effective treatment for you-you need to know that there is hope, and there is someone here who has helped many other keloid sufferers like you. When a healthy person receives some sort of injury to the skin, such as an incision from surgery, or piercing, their skin goes through a rather predictable healing cycle. The skin fuses back together, some scar tissue forms and, through a very complex negative feedback system, the body arrests the healing process once it’s complete. In a keloid sufferer, the negative feedback loop that informs the body that it’s time to stop the healing process doesn’t function as it should and results in an uninhibited, excessive and prolonged wound healing response; as if the brakes on the wound healing process were malfunctioning. The result is an excessive and perpetual healing response and keloid formation. Now, if we operate on a keloid and cut it out surgically, the same abnormal wound healing mechanisms are triggered, leading to the formation of a new, yet much larger keloid. Cryotherapy, on the other hand, does not induce a cut in the skin. The underlying tissue remains intact and the wound healing response does not lead to keloid formation. I started seeing Dr. Tirgan sometime in Nov of 2014. I've tried cryotherapy and chemo drug injection. As Dr. Tirgan says both involve some pain and cryotherapy tends to be messy. But the results are good, the keloid is softer and thinner. Dr. Tirgan doesn't make you feel like there's only a short amount of time to see him and he treats you like a normal person. Dr. Tirgan is in a class of his own as a Doctor who is passionate about the care and healing of his patients. Not only is he the leading expert in Keloids, he is always responsive and will go out of his way to attend to his patient's needs. After visiting multiple dermatologists with no results, I will only trust Dr. Tirgan to continue with his proven treatment methods. Keloid is a chronic skin disorder, which negatively affects many aspects of patients’ lives. Keloid Disorder can present itself either as a single small spot on the skin or appear as multiple lesions spread across several areas of the body. In some patients, keloid lesions can grow to form a large skin tumor. Keloid has a genetic component, often runs in families, and is most often seen in Africans/African Americans and Asian populations, although it has been reported in individuals from almost all ethnic backgrounds. If someone is predisposed to the condition, a keloid appears only after an injury to the skin, which can happen in myriad ways such as ear piercing, acne, surgery, chicken-pox, etc. Why to see Dr. Tirgan? New York has hundreds of dermatologists and plastic surgeons who among everything else, also treat keloid, but Dr. Tirgan is the only physician whose medical practice is solely focused on the treatment of keloid patients. He has provided care to close to 900 keloid patients, when many others may only see few cases per month. 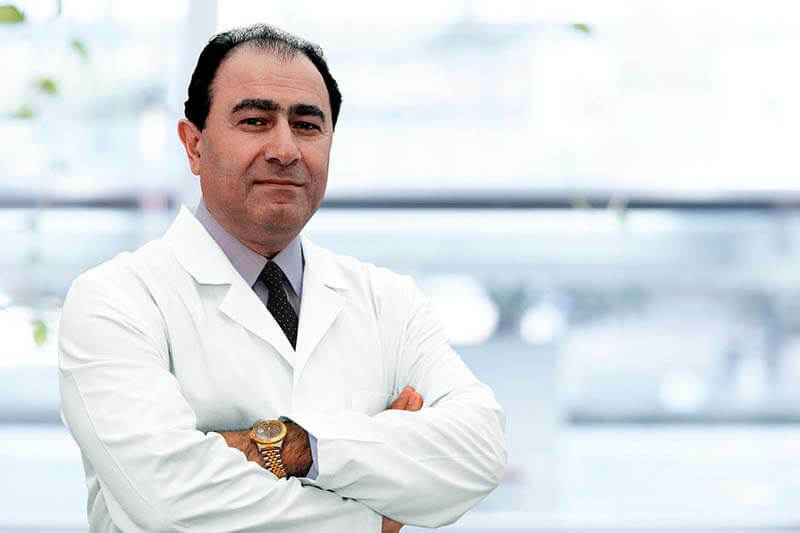 He is a leader in keloid research and cryotherapy for keloids. Dr. Tirgan is the founder of Keloid Research Foundation, speaker at several conferences on the topic of the keloid. Together with international colleagues, Dr. Tirgan is now organizing the 1st International Keloid Symposium which will be held at Rockefeller University in September 2016. Dr. Tirgan is pleased to announce that the 2nd International Keloid symposium was successfully held on June 7-8, 2018 in Rome, Italy. This meeting brought an international group of speakers and audience from 22 different countries, Dr, Tirgan is now working on the 3rd International Keloid Symposium which will be held on April 19-21, 2019 in Beijing, China. This meeting will hopefully attract many more specialist clinicians, dermatologists, plastic surgeons as well as laboratory-based scientists and researchers under one roof to discuss the challenges of this poorly understood and under-studied human ailment for the benefit of those who suffer the most, the keloid patients. Keloids are an important medical problem which is often under-appreciated by the medical community. Dr. Michael Tirgan has spent many years evaluating and treating patients with keloids in different regions of the body. The Atlas of Ear Keloids presents new insights into the natural history of keloids and provides a perspective that many of the standard surgical approaches may actually lead to progression of these tumors on the ear. He presents good examples of an alternative treatment with cryotherapy that has convincingly eliminated some of the most troublesome keloids on the ear. This book will provide valuable information to patients with keloids on the ear and to medical professionals that treat these lesions. Atlas of Ear Keloids is available on Amazon.com.